I love potato leek soup. It’s filling and warms you right down to your toes. It’s a classic soup that sometimes gets overlooked when it’s time to decide what to make for dinner. My recipe is not only elegant, but easy to make. Start by melting the butter in a pot. Then add the leeks and stir. Let the leeks cook until translucent. Keep an eye on them since they have a tendency to burn if not stirred every so often. When the leek are softened, add the leek broth to the pan, reserving about a 1/2 cup just in case you need to adjust the consistency at the end. Add in the potatoes and stir. Let the soup cook for 30-45 minutes or until the potatoes are cooked through. (You want the potatoes to slide right off a knife when they are pierced) Using a blender or an immersion blender, puree until the soup is thick and velvety. Season and garnish with chives and/or bacon. It is also great with fried onions or potato chip crumbled on top. Put the leaves and the water in a pot and bring to a boil. Lower the heat to a simmer and let cook for 45 minutes. Strain the liquid out and set aside for the soup. I love how versatile this soup is. 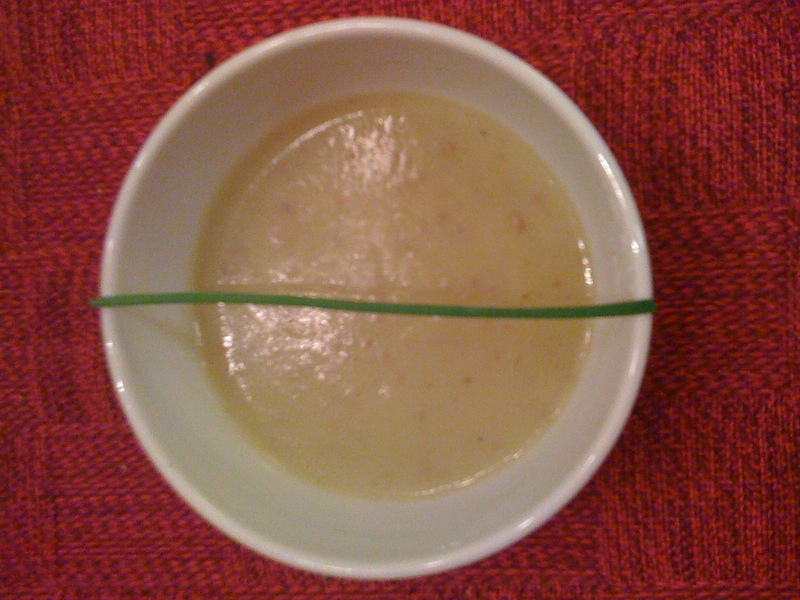 You can serve it hot, or serve it chilled as vichyssoise. Either way this soup is a simple way to get your veggies in, and because of the potatoes, the soup is luscious and creamy. For an even lighter version, use olive oil instead of butter. If you want to go the other direction and make something more decadent, use bacon fat instead of the butter. Sounds good, I always have a container of bacon grease in my fridge, I guess because my Mother did too. The kids laugh at me. But hey you never know when you might need it….keep the recipes coming. Yum! I’ve never thought to make leek broth before, but the soup looks great! I love using all the parts of the veggies I get… they can be so expensive why not squeeze every drop of flavor out of them! Plus there’s not all the extra sodium that canned stock can bring to the party.